Lu Beiping is one of 20 million young adults the Chinese government uproots and sends far from their homes for agricultural re-education. And Lu is bored and exhausted. While he pines for romance, instead he's caught up in a forbidden religious tradition and married off to the foreman's long-dead daughter so that her soul may rest. The foreman then sends him off to cattle duty up on Mudkettle Mountain, far away from everyone else. On the mountain, Lu meets an outcast polyamorous family led by a matriarch, Jade, and one of her lovers, Kingfisher. They are woodcutters and practice their own idiosyncratic faith by which they claim to placate the serpent-demon sleeping in the belly of the mountains. Just as the village authorities get wind of Lu's dalliances with the woodcutters, a typhoon rips through the valley. And deep in the jungle, a giant serpent may be stirring. The Invisible Valley is a lyrical fable about the shapes into which human affection can be pressed in extreme circumstances; about what is natural and what is truly deviant; about the relationships between the human and the natural, the human and the divine, the self and the other. Like many Chinese writers of his generation, Su Wei spent his teenage years being "re-educated" through farm labor in the countryside, working for ten years on a rubber plantation in the mountains of tropical Hainan Island. He is known for his nonfiction essays as well as for his highly imaginative novels, which are seen as unique in their treatment of the Cultural Revolution. He left China in 1989, and since 1997 he has taught Chinese language and literature at Yale University. 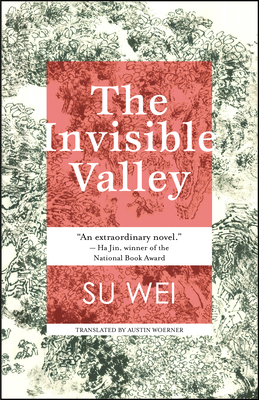 The Invisible Valley is his first book to be translated into English. Austin Woerner is a Chinese-English literary translator. His works include two volumes of poetry, Doubled Shadows: Selected Poetry of Ouyang Jianghe and Phoenix, and a novel, The Invisible Valley by Su Wei. He served as English translation editor for the innovative Chinese literary journal Chutzpah!, and co-edited the short fiction anthology Chutzpah! : New Voices from China. He holds a BA in East Asian Studies from Yale and an MFA in creative writing from the New School. He lives and works in Shanghai, China.